NPR Journalists Narrowly Escape Car Bombing The attack took place during a reporting trip to western Baghdad's battle-scarred Rabiye Street. Join Ivan Watson for a live chat Tuesday at noon ET. The NPR foreign correspondent will answer your questions about Sunday's car bombing in Baghdad and talk about daily life there. An NPR correspondent and three members of NPR's Iraqi staff narrowly escaped an apparent assassination attempt in Baghdad on Sunday after a hidden "sticky" bomb exploded underneath their parked, armored BMW. The car exploded in a pillar of flame and was destroyed. No one was injured in the attack. 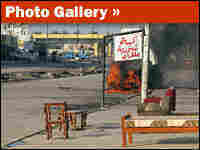 The bombing took place during a brief NPR reporting trip to western Baghdad's battle-scarred Rabiye Street. Rabiye Street was once a bustling commercial boulevard, where boutiques and popular cafes faced the gardens of a grassy median. At the height of the fighting in 2005, 2006 and 2007, this district was the scene of intense clashes and bloody massacres involving insurgents from al-Qaida in Iraq. Today, many storefronts are still blasted, burned and empty from multiple car bombs and roadside bomb attacks. Iraqi police and soldiers man checkpoints at several points along the street. NPR Iraqi producer and translator Ali Hamdani; two Iraqi drivers, Mohanad Adhab Mahdi and Dawood Salman; and I had stopped to conduct interviews in a kebab shop, just a few yards from an Iraqi army checkpoint. Our group spent about 45 minutes there, eating lunch and conducting interviews with the shop's two owners. The armored BMW and a second NPR "chase car" were parked in the street out front. At the end of the meal, the NPR team was headed back to its vehicles but stopped for a moment when kebab shop owner Athir Abdul El Mawjood began showing the bullet holes that still pockmark the front of his business. Suddenly, Iraqi soldiers ran up screaming "bomb" in Arabic and pointing at the parked BMW. They blocked oncoming traffic, and an Iraqi officer named Lt. Mohamed Jabbour physically pulled one of our drivers away from the parked car. Seconds later, the BMW exploded and burst into flames some 15 feet from us. The bomb appeared to have been one of the so-called sticky bombs that insurgents have increasingly used to lethal effect in Baghdad over the past year. The bombers use magnets to attach the explosives to the underside of parked vehicles. The device was placed underneath the driver's side of the vehicle. The force of the blast blew out the vehicle's armored floor plates. There was no sign of the steering wheel. Looking at the twisted wreckage of the interior, it is hard to imagine how any passengers seated inside could have survived the attack. Either because of the makeup of the bomb or because of the solidity of the armored vehicle, the explosion did not hurl any shrapnel into the crowd standing nearby. In fact, the blast did not even damage several cartons of eggs lying on a street vendor's table on the sidewalk just six feet from the BMW. Iraqi and American soldiers cordoned off the area. An Iraqi army officer said an informant had called in with a tip that the bomb had been attached to the BMW while the NPR journalists were inside the restaurant. "I received a call just three minutes before it exploded," said Iraqi national army Capt. Heider Fawzi. He said he immediately issued orders to stop traffic on Rabiye Street and to prevent anyone from approaching the vehicle. Fawzi said the bomb may have been triggered by remote control. "I believe the man who detonated it was watching [you], because the second I ordered the troops to block the roads, he detonated it. He realized it was over. He had been discovered," Fawzi said. Fawzi said he arrested one suspect — one of the egg vendors from the shop next to the parked BMW. The Iraqi officer said the suspect had been under surveillance for some time because one of his family members was allegedly a member of al-Qaida in Iraq. Jabbour, the Iraqi officer who first warned the NPR team about the bomb, watched as Iraqi firefighters hosed down the smoking wreckage of the vehicle. "I was just doing my duty," he said, when thanked for his swift action, which may have saved the lives of the NPR staff. Today's survivors were lucky. According to Iraq's Ministry of Defense, there were a total of 108 bombings in Baghdad in November, which killed 148 Iraqi civilians and 22 Iraqi police officers and soldiers. The attack on the NPR vehicle Sunday marked the 28th use of a sticky bomb in Baghdad this month. Watch a video shot about 30 minutes after the bombing.